I decided to try a recipe a co-worker had given me for Georgetown Cupcake’s “Chocolate Cupcakes with Vanilla Buttercream Frosting.” I figured screw the line. I’m making my own. Let’s see what all the fuss is about. Perfect timing too as today is my husband’s birthday. Yay for birthdays! Speaking of birthdays, my birthday was last week and I got a brand new camera, perfect for the ol’ blog. No more Iphone pics! Still figuring all the buttons out so bear with me. 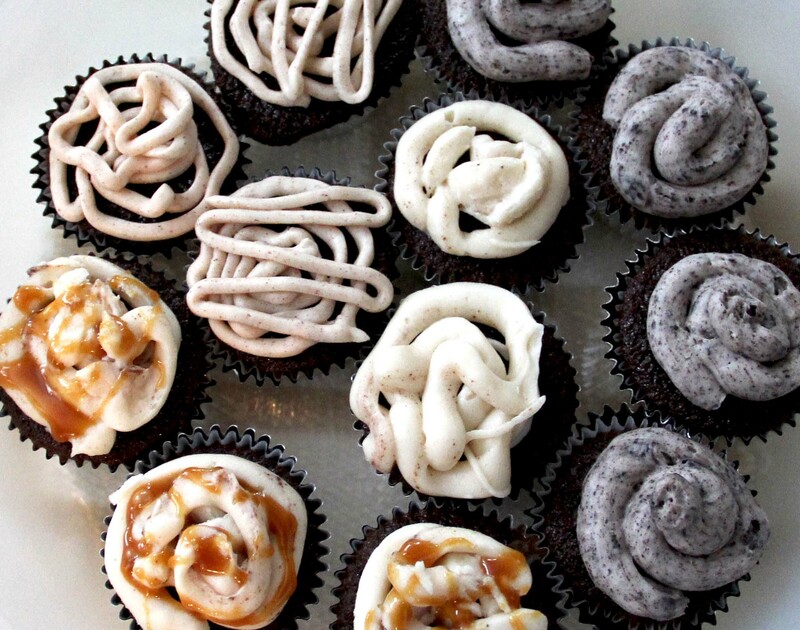 Enjoy the pics and try not to drool over these lovely cupcakes. Verdict? These were VERY tasty! A light, fluffy cake base with a seriously decadent frosting. Try them out! Recipe follows. 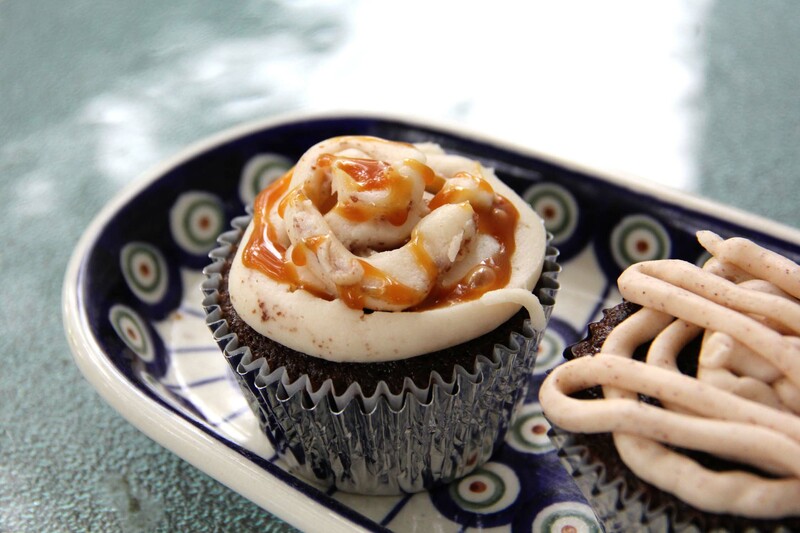 Note: If you like your buttercream extra sweet, add more confectioner’s sugar. If you like it less sweet, decrease the sugar! First up, preheat your oven to 350 degrees. This recipe makes about 18 cupcakes. Line a standard cupcake pan with 12 baking cups, and a second pan with 6 baking cups. 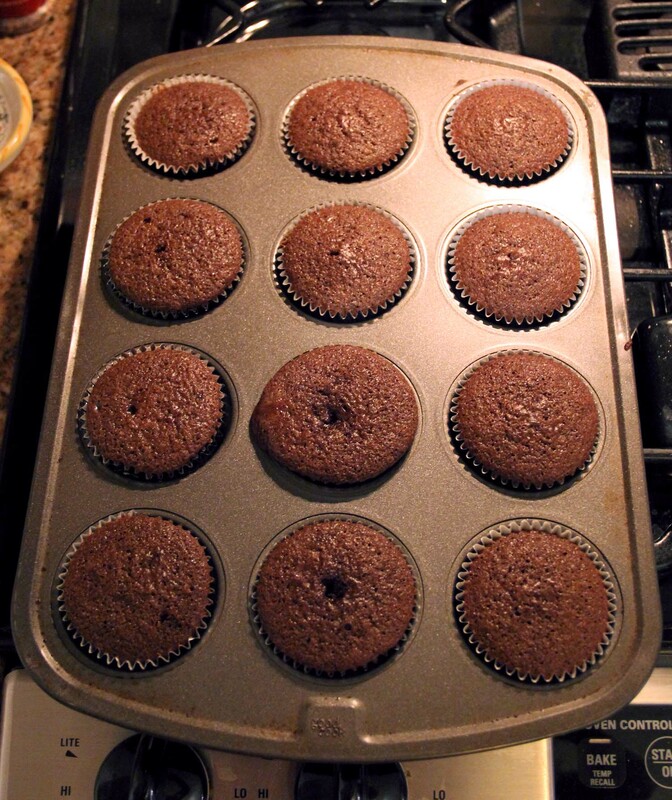 Or, if you only have a 12 baking cup cupcake pan, do your first batch, then cook the remaining six. 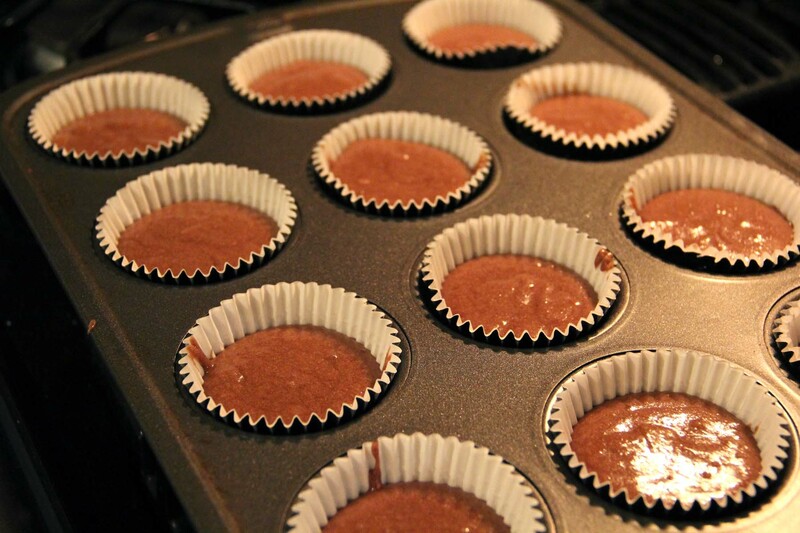 Add water to the empty cupcake holders as this will ensure everything bakes evenly. Sift together the flour, baking soda and salt in a large bowl. In another large mixing bowl, add your butter. Beat until fluffy. Once fluffy add the sugar, blend until well incorporated. Add one egg at a time. Mix slowly after the addition of each to ensure a perfect batter. Next up, combine vanilla extract and milk in a large liquid measuring cup. Reduce the speed to low. Add one-third of the flour mixture to the butter mixture, then gradually add one-third of the milk mixture, beating until well incorporated. Continue this way (1/3 flour, 1/3 milk) until all the flour mixture and milk mixture has combined. Add the cocoa powder on low speed until just incorporated. Fill each cupcake holder to 2/3 full. Bake for 18 to 20 minutes (start checking at 15 minutes) or until a toothpick inserted into the center of a cupcake comes out clean. Transfer the pan to a rack to cool. Place the butter into a large bowl. Add the confectioners sugar and beat on medium speed until well incorporated. Add the vanilla extract, milk and salt and beat on high speed until light and fluffy. 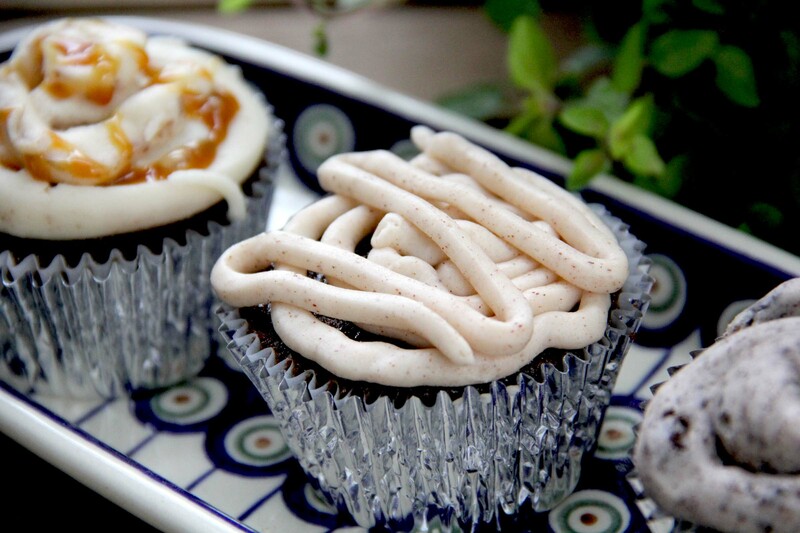 Place frosting in a disposable piping bag with a large round tip and frost cupcakes. 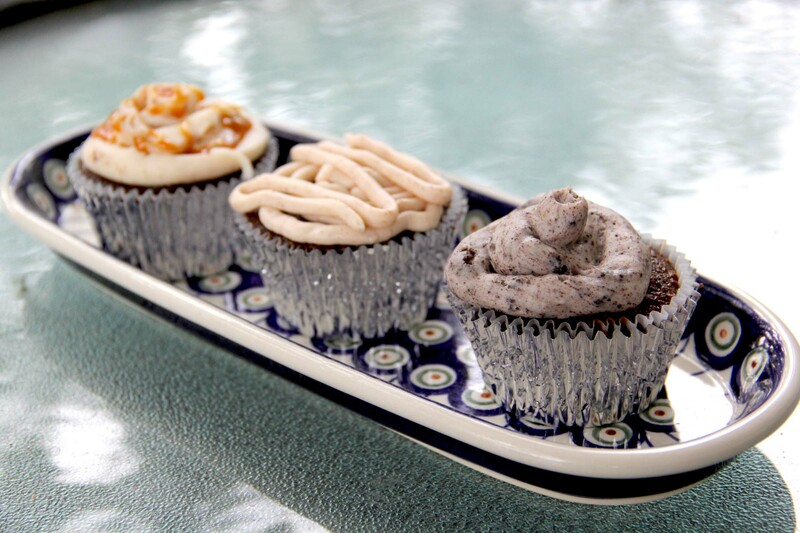 I did a few buttercream flavors: oreo cookie, cinnamon and caramel. Very simple! 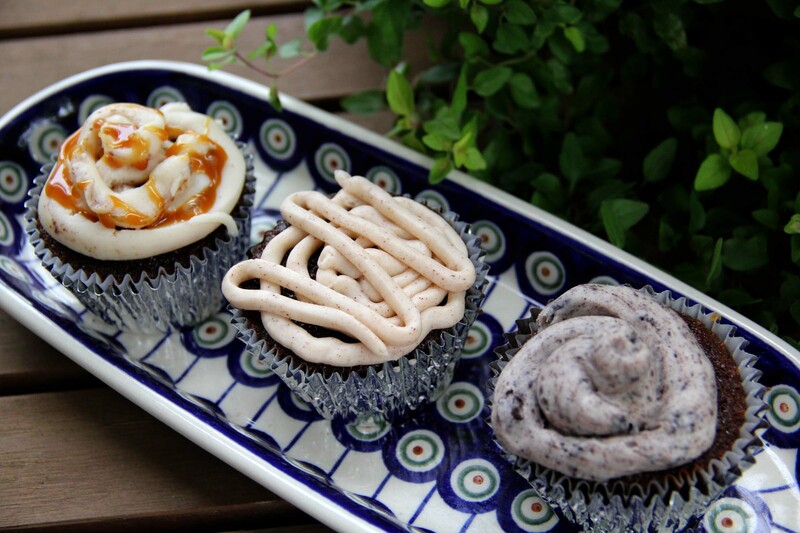 I just added a bit of cinnamon to the buttercream for the cinnamon frosting (pictured, middle), topped the buttercream with dulce de leche caramel with sea salt (pictured, left), and crushed up some oreos and added them to the buttercream for the oreo topping (pictured, right). See some other combos below the pictures!